We are all so different, she says, and we should all celebrate our individuality. In this elegant bridal photo shoot, Harnaam Kuar is doing just that. She was badly bullied at school, and her classmates beat her up more than once. As a result, Harnaam became "aggressively suicidal" and started harming herself. At age 16, she hit her lowest point. "I had been suicidal all year due to immense bullying from school and people in society. I hid away and did not want to venture out into the public. My bedroom was my only safe haven. I was hugely depressed. I remember sitting on my bed and thinking about taking my own life. "But instead, as I sat ther, I started to counsel myself. 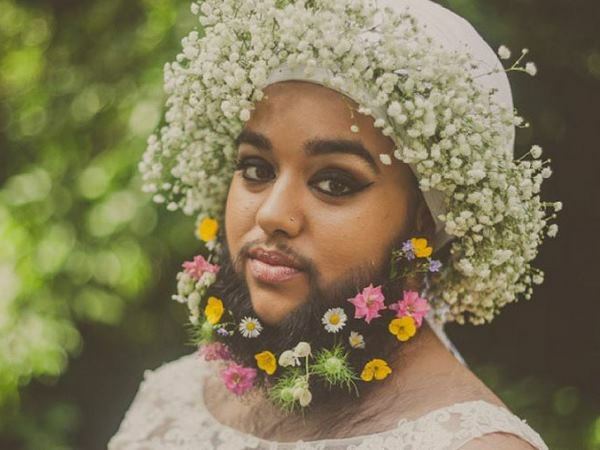 I told myself ‘The energy you are putting into ending your life, put all that energy into turning your life around and doing something better’.” She decided to embrace her beard, and proudly refuses to shave it to this day. Now, Harnaam thinks of herself as a "body confidence activist." "I am happy living as a young beautiful bearded woman. I have realised that this body is mine, I own it, I do not have any other body to live in so I may as well love it unconditionally.” Urban Bridesmaid photographer Louisa Coulthurst was intrigued by Harnaam's powerful take on self-love, and wanted to capture that in a photoshoot. “I first saw Harnaam’s portrait in the Beard Exhibition held at Somerset House in March,” she said. The photos have since gone viral online -- and so has Harnaam's message.